The Guestbook: weaves together the heart of Nicholas Sparks' books, the romance of Nora Robert's work, and the charm of Debbie Macomber. Fleeing her picture-perfect life among the privileged set and the wreckage of a failed marriage, Lily Parkins moves to the only place that still holds happy memories: her grandmother's farmhouse, now a converted B&B on the enchanting Madrona Island. After learning her grandmother has passed away, Lily is left with only an old guestbook as her guide - a curious book full of letters, recipes, and glimpses into her family history. She is determined to embrace her newfound independence and recreate herself, one page at a time. With the help of quirky island residents, she finds the strength to follow her passion and culinary dreams. But as soon as she has sworn off men and is standing on her own two feet, Lily meets Ian, the alluring artist who lives next door, and her new life is suddenly thrown off course. The last thing she wants to do right now is fall in love. Ultimately, Lily must decide if it's worth giving up her soul for security or risk everything to follow her heart. This book is full of comfort and happiness. The main character is trying to find peace after she finds out her marriage is ending. She finds her passion, romance, friendship, and peace by restoring the old Inn her grandmother used to own. I loved how vivid everything was in this book; from the emotions, to the scenery, to the recipes. It made you want to be a guest there and meet these people. I love stories like this. 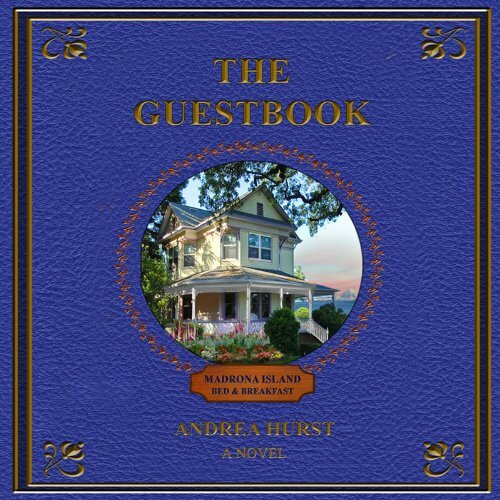 The Guestbook is a warm and endearing story about a woman Lily leaving her failed marriage and finding hope and renewal at her grandmother's old bed and breakfast on Medrona Island in upstate Washington where the apples and the air are crisp and the people are friendly and accepting and the love is contagious. She meets so many new and wonderful friends such as Jude, outgoing and helpful, who owns the the Island Time Cafe. Kyla, quiet yet friendly and battling her own issues, who owns the Tea and Comfort shop. She meets and befriends her neighbor John who is an elderly man whose grandson Ian becomes Lily's love interest over time. Lily finds her grandmother Maggie's old guestbook and initially finds a few cookie recipes inside it. She reads the entries written in the guestbook from the people who had stayed at the bed and breakfast over the years and always feels a sense of renewal afterwards. The guestbook keeps her moving forward with plans of re-opening the inn. The one thing she can't find though is her grandma Maggie's heavenly brownie recipe. I really enjoyed this book. It was fun and pleasant and I would love to see a follow up book to The Guestbook. I would recommend this book for a great summer listen or read. I also thought that Teri Schnaubelt did an absolutely terrific job with the characters in this book. All the characters were distinctly different and she had great flow in her performance. I look forward to more from her and the author Andrea Hurst. I received this audiobook free of charge in exchange for an unbiased review. Would you consider the audio edition of The Guestbook to be better than the print version? Good reader...yummy recipes at end. Would you recommend The Guestbook to your friends? Why or why not? Yes, easy engrossing read. Best for women. No. It was easy to take breaks. What did you like best about The Guestbook? What did you like least? I liked that Lily (the Female lead) decided to find out more about who she is as a woman, and that it felt nostalgic. Would you be willing to try another book from Andrea Hurst? Why or why not? Yes, I would. The story was good, it did drag a bit through the middle. But overall I enjoyed the writing. The narration did set the tone for the story, and matched it well. Did The Guestbook inspire you to do anything? It did make me realize that we are in charge of our own happiness. We chart our own course in life, and it's never too late to start over and live the life you want in order to bring you personal happiness! I'd recommend this story for readers who like contemporary romance, that focuses more on the story, and not about the intimacy between two people. There is romance, but this is more of a coming into yourself story! easy listen.... pleasant...happy story....loved it!! bonus: can't wait to try the recipes at the end!!!! What did you love best about The Guestbook? Presentation and added recipes- location description having lived in WA. The part about the secret was a little bit of a let down- could have had more of a punch to it. Good book with lots of very friendly people and some not so nice. Even the not so nice had reasons. What made this a difficult book to read? It was crammed full of delicious food! It made me want to go find chocolate, and bake cookies. Oh and the wonderful sea food recipes. I am certain I gained 10 lbs reading it! Wonderful Charactors in this book. Yes I would recommend this book to a friend. It was entertaining and has twists and turns. I like a book that does that. What was one of the most memorable moments of The Guestbook? The looking for the brownie recipe. Will it ever be found? The scene where everyone pitches in. What a great place to live. I wanted to move there. Teri Schnaubelt does all the charactors so well. Men's voices, women's voices, childrens voices. You always know who is speaking. It makes listening so enjoyable and entertaining. When Grampa becomes ill, I worried as if it was a family member. He would be missed if things do not go the right way. Immediately, I fell in love with the grandmother, keeper of a guest book that had been signed by those who had stayed at her Inn. The inn was created when she had to come up with a way to support herself following the passing of her husband. She was a lady to be admired for her courage and resilience during adversity. Over the years Grandma Maggie became one of the leading citizens of the island that had been her home, and onr she seldom left. She sold baked goods to local businesses to help with expenses. Her granddaughter, Lily, had spent most of her early years staying with her grandmother, gardening, baking, and playing together. As an adult, Lily was a beautiful accomplished culinary chef, married at 19, educated and molded by her successful, handsome husband of 10 years, Brad. During those 10 years, she devoted her life to fulfilling his every need. She allowed herself to be cut-off from her mother and grandmother, because Brad convinced her that he was her family, now.. Her relationship with her mother was strained , because she never appreciated Lily's dependence on Brad, and always reminded Lily that she wasn't the daughter that she could talk with any longer. More than enough of the book's beginning!! Now, you will have to read/listen to The Guest Book to find out the best part of the book. The narration was easy to listen to, as she portrayed the many characters iin the book. 5 stars for her! Enjoy!!! I sure did!! I was ready to listen to a nice story and The Guestbook certainly was a good choice. The reader was also very pleasant. Thank you from Sandra in New Zealand. Now it is time for my coffee.